Say Yes And! | Say Yes And! Can Two Little Words Really Transform Your Career, Organization, and Relationships? “Yes, And” they can also do much, much more! If you have ever talked yourself out of a goal, stuggled to create change in an organization, or had difficulty managing personal and professional relationships, then chances are, you are saying, “yes, but” to your clients, your co-workers, your family, or yourself. By simply changing “yes, but” to “Yes, And,” you will become happier and more successful, you will take greater control over your life, and you will increase your ability to achieve your goals and dreams. This fun little book will help you figure out what you have been saying, “yes, but,” to, what that has been costing you, and how to transform your results by switching to “Yes, And.” If you have ever talked yourself out of a goal, stuggled to create change in an organization, or had difficulty managing personal and professional relationships, then “Yes, And!” is the book for you! Bring the power of “Yes And”! to your next meeting, conference, or event with this hilarious and interactive keynote! 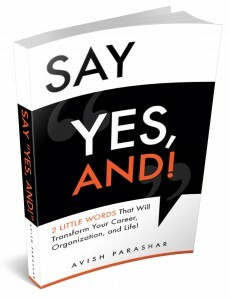 Let Avish work with your group to transform your organization into a Yes And! organization! Learn how to give the gift of “Yes And!” to your whole team, department, association, or organization!